August. It is AUGUST! No freaking way! Instead of panicking, let's just admit that July is over (though it seems to have just started). I'm going to cope with it by reviewing what I did accomplish in July. Maybe I'll feel better about the loss of another month by the end of this post. 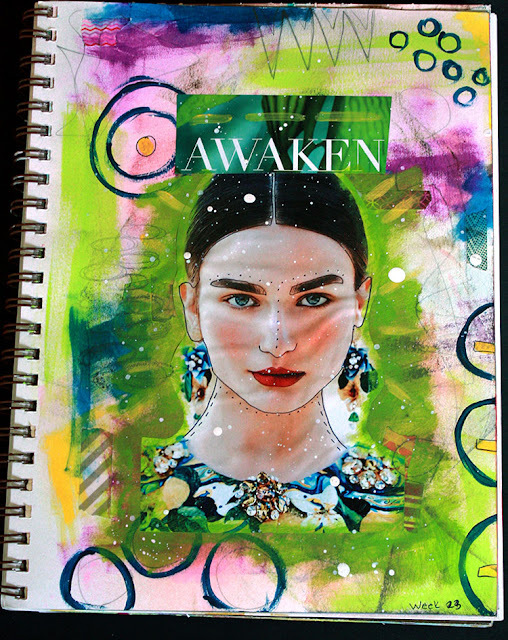 As a reminder, each week I wanted to complete a Goal, a piece of Jewelry, an altered Card, at least one Blog post, and a Journal page. I'm covering weeks 26-30. Also, please note that I'm WAAAAAYYYY behind in these goals and tasks so a lot of this will be showing how I caught up. My goal for the week was to finish up the e-magazine for ZnetShows. And it appears that that was ALL I did as nothing else got accomplished. However, I did complete this goal. And I think Creative Spark Summer 2016 looks mighty fine. 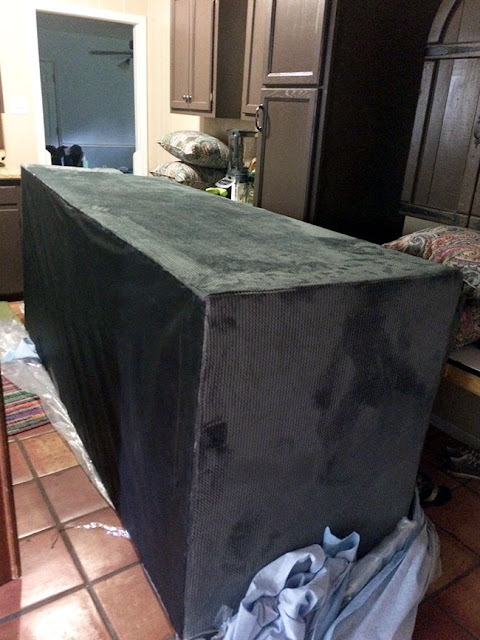 This week I worked on hosting a 4th of July party at our house. I mentioned the party in my post about our staycation. I think it was a roaring success. Goal accomplished! As I mentioned previously, we were on vacation during part of June and had one of the nieces staying with us. She had a few doctor appointments during the week. While sitting in the waiting rooms, I worked on some of my altered playing cards. With this method, four cards were completed. I counted them as a catch-up for weeks 20-23. 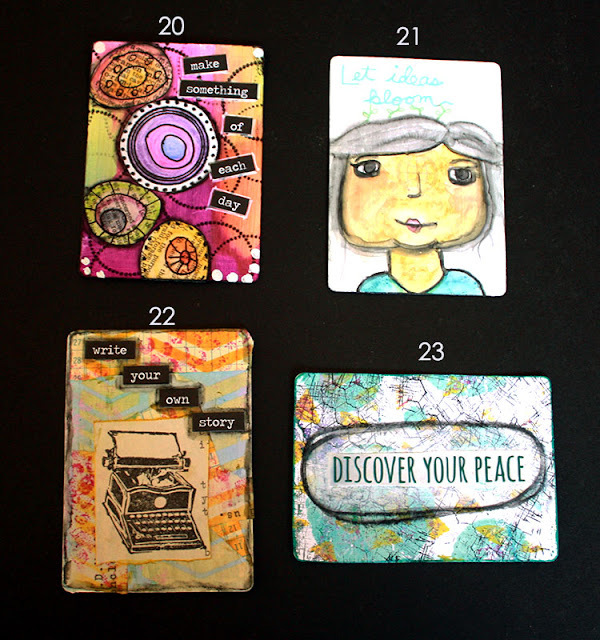 Week 20: The background was made with some acrylic paints followed by circle stamps. A few stamped/colored images were glued on top and outlined. 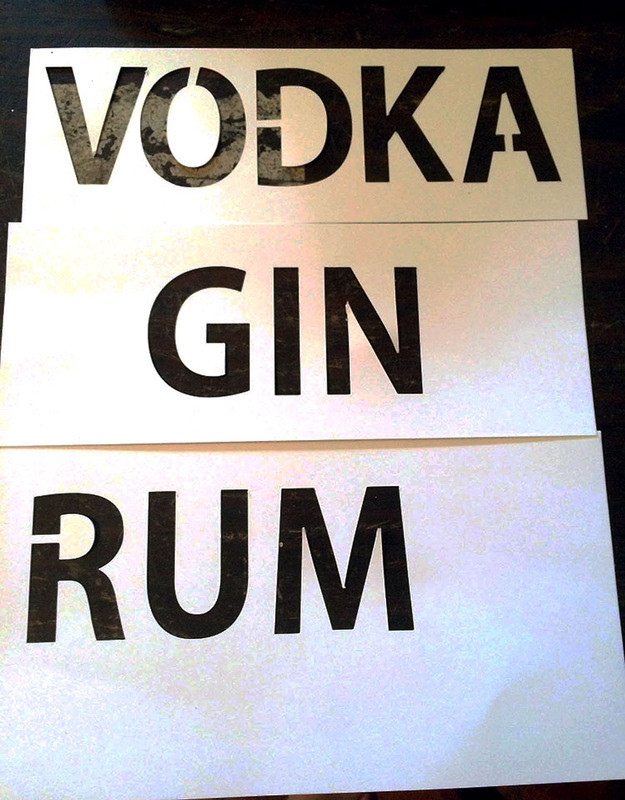 I added some word stickers and dots of liquid correction fluid. Week 21: I practiced some of my face drawing. You can just barely see the words I wrote above the face that say "Let ideas bloom". I did the whole drawing with neocolor ii pastels and the words with a marker pen. 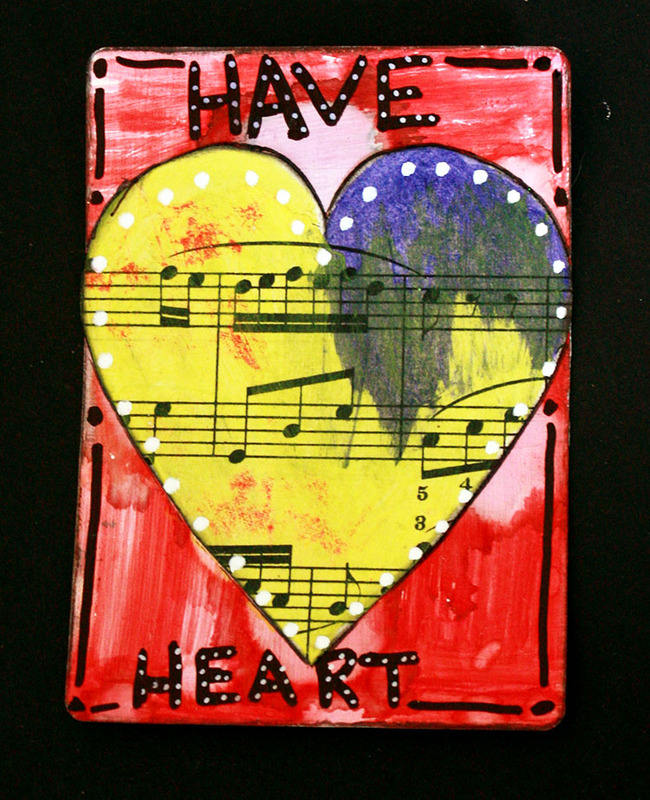 Week 22: Layers of stamps, stencils, and collage papers were used to make the backgroud for this card. I added a stamped image of a typewrite and the words "write your own story". The words and card are edged with watered-down stabilo all pencil. 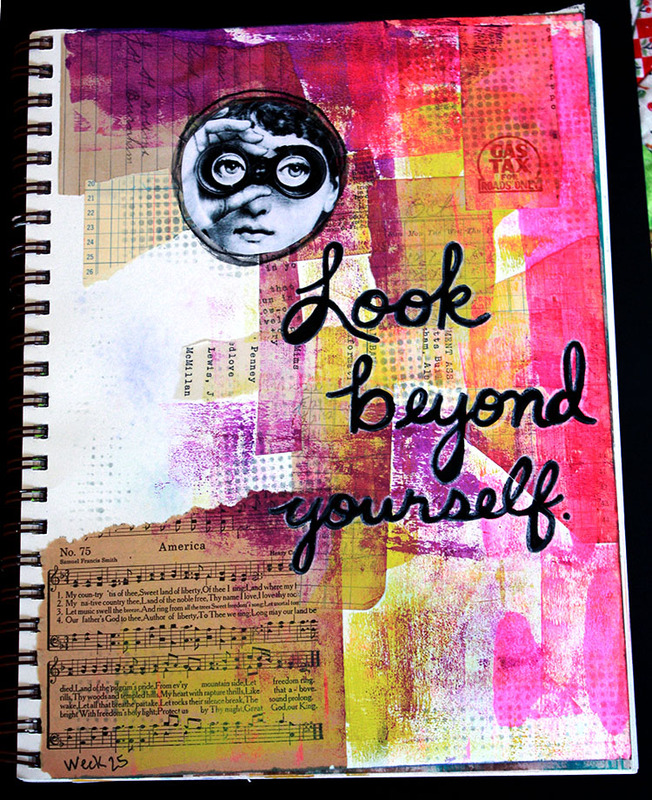 Week 23: The background was a gelli print covered in texture stamps to create a chaotic image, The phrase is a magazine cut-out that I colored around with a white neocolor ii and then circled with a black one. 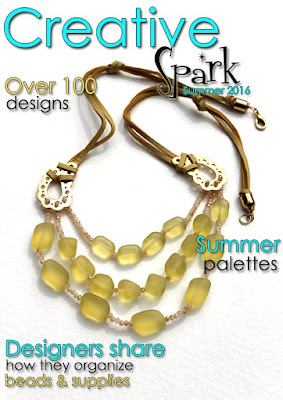 I shared my designs and a little about the e-magazine in my Creative Spark Summer 2016 reveal post. 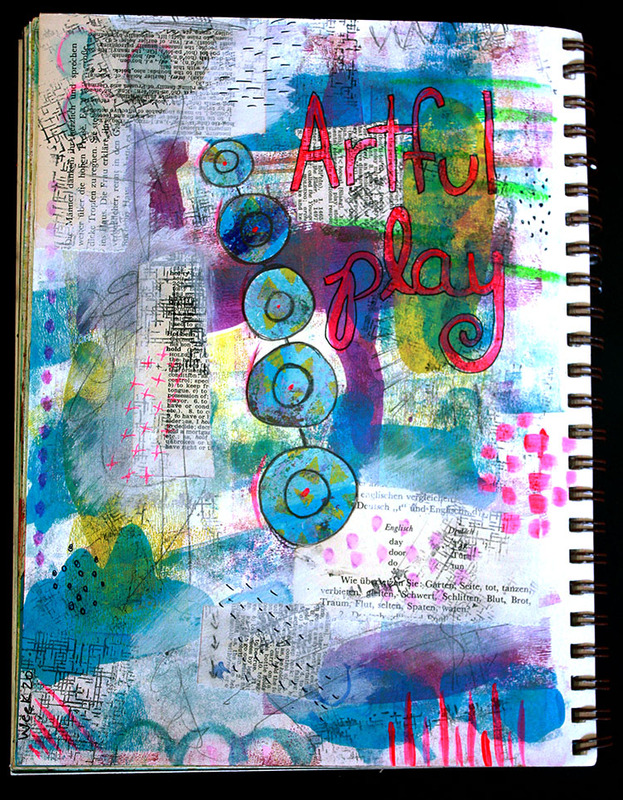 Being on vacation gave me a little time to play, so two pages in my art journal were completed. Week 20: The background was created with acrylic paints and collage papers. The center circles were cut from a gelli print and doodled onto. The words were added with just a paintbrush and paint. I doodled and made marks with a pencil and more of the bright pink paint to finish up the page. Week 21: Let me start my admitting that this isn't a favorite page of mine. I used paper, paint, posca pens, neocolor iis, and stencils to make the page. They can't all be winners. 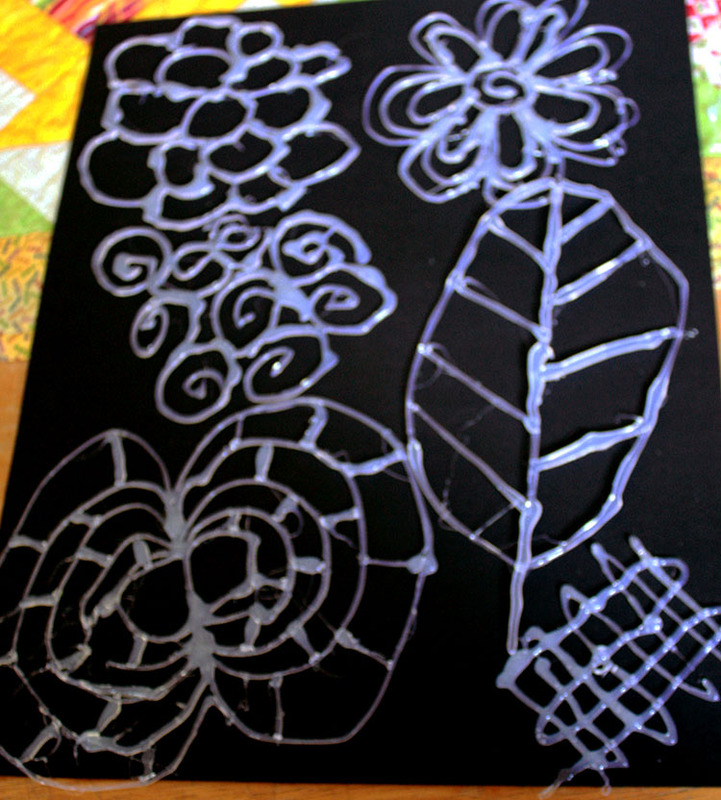 My goal for this week was to make hot glue gun stencils as I had seen and used some of my friend Tiffany's. However, I just didn't get to it this week. Don't worry, it's further down on this list. Instead of getting to my goals, I did get quiite a bit of jewelry made/finished this week. I decided to use the muffin tin method and put most of the components I needed to make pieces into the cups of a muffin tin. This totally helped me stay focused as to what to work on next. In this manner, four pieces were completed. Week 16: You can't really see the focal piece but it's a brass charm with an arrow embossed in it. 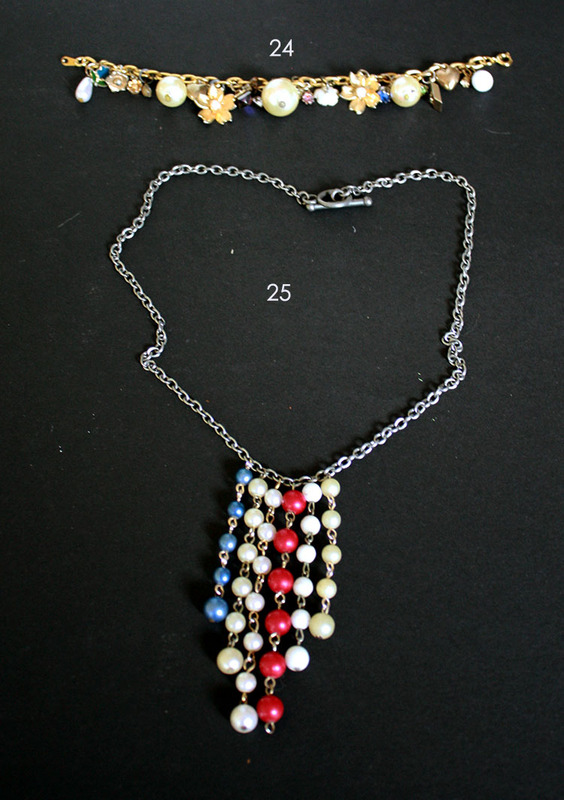 The chain was made of white glass beads and brass wire. Simple. I have no idea why it too me so long. Week 10: Talking about taking me too long to complete. GAH! 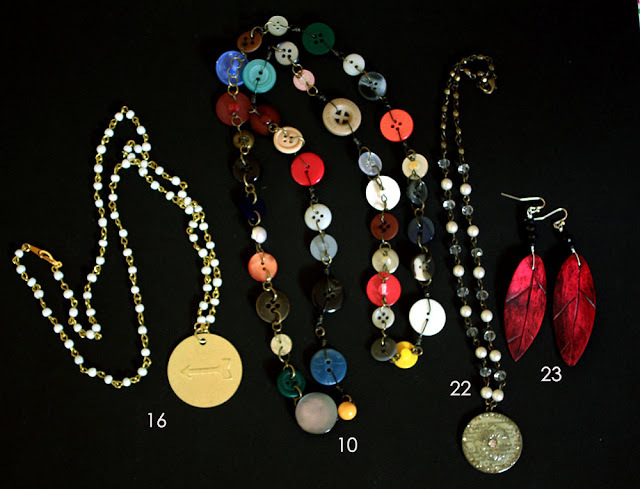 This long necklace is made from buttons that were the last ones on button cards in my stash. I used antiqued brass wire, headpins, and jump rings to connect them. The delay arose when I ran out of a certain size jump ring and couldn't find them anywhere for weeks. Once I finally got some more, I was able to finish up this quirky necklace. Week 22: The focal for this is one I made. It's some text, a button, and glitter encased in ice resin in a bezel. 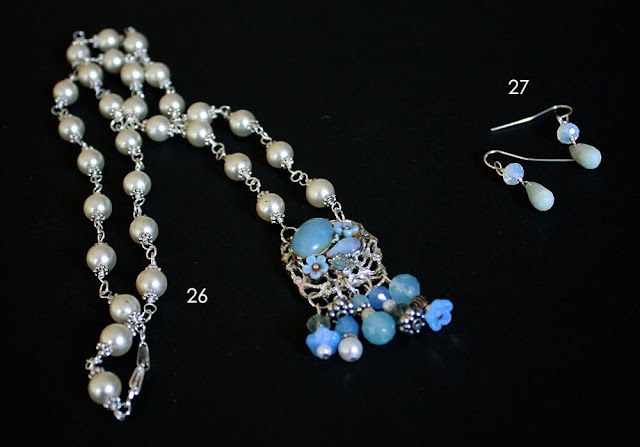 I used glass pearls and clear crystal rondelles for the front part of the chain. 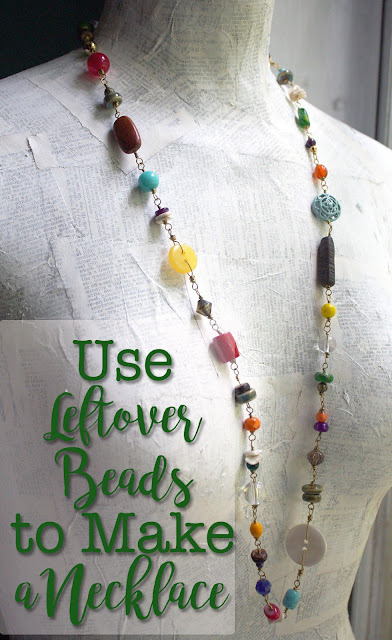 The end of the chain uses antiqued brass beads. Week 23: While going through one of my treasure jars (old jewelry I buy at thrift and antique stores and put into jars), I found a zipper pull that had these two bright pink wood feathers on them. Using some watered down acrylic paint, I darkened then sealed them. From there, a few black beads were added to connect the feathers to the ear wires. Done. This week I wrote up my recipe for my favorite Arugula, Tomato, and Cucumber pasta salad. I was able to get one journal page done. This one would have been for Week 22. I like this one much more than the previous one. 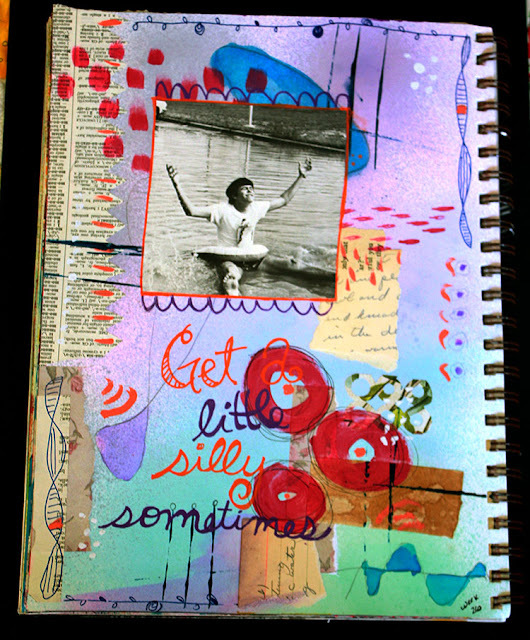 The background was made from gelli prints that I glued down then lightly gessoed over. 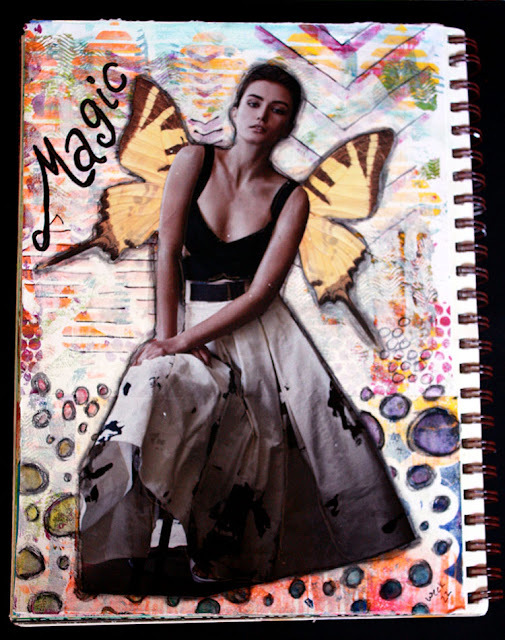 The girl is a magazine image and the butterfly wings are from a book. 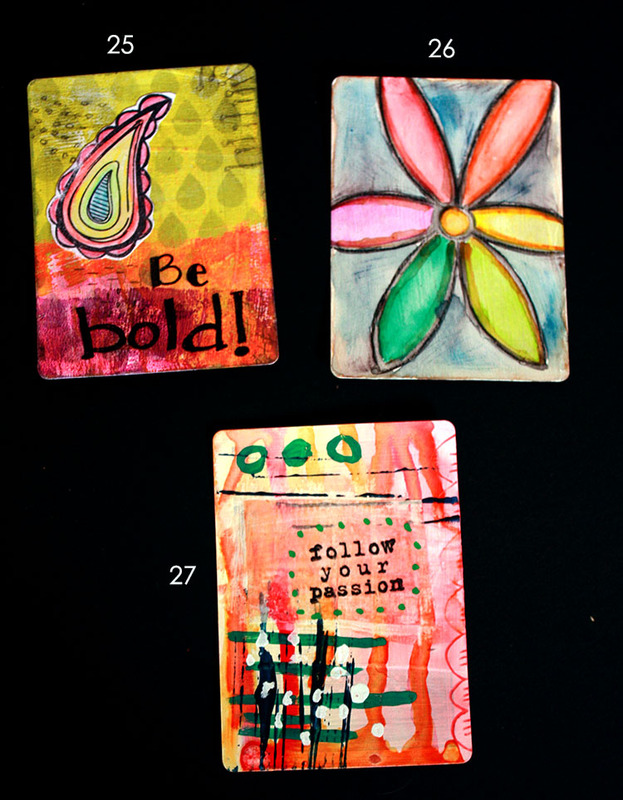 I glued and sealed them with matte mod podge to take away that magazine shine. "Magic" was written with a sharpie water-based poster paint pen. I accented the word and the girl with a gelly roll stardust pen. As well, the circles at the bottom were made and filled in with neocolor ii crayons. Since I was making great strides in my goals and tasks, I decided to try another catch up week. While I put in a great effort to do this (as you'll see), I still haven't caught up yet. In my catch up attempts, I got to some of the backlog of goals to be completed. Week 11: The actual knitting wire portion of this goal (learn Viking Knit) was done weeks ago. 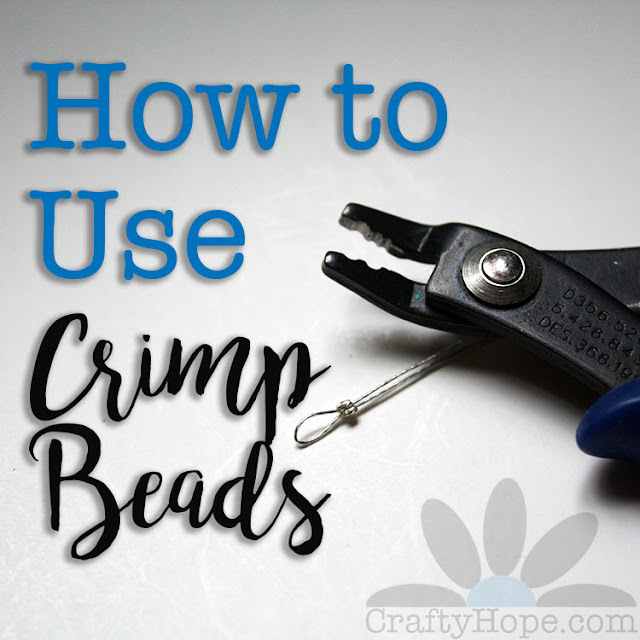 However, I needed the thing with the holes to pull the wire through. Pat was finally able to knock that out for me so I could knock this off my list. 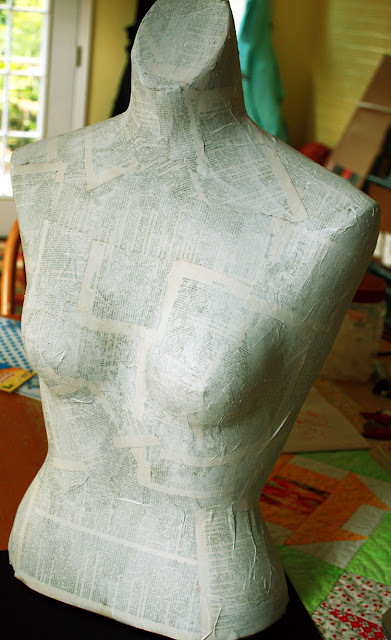 Week 21: Cover mannequin - I've had this flesh-tone plastic mannequin bust for several years now. I love using her for my jewelry pictures but have had to put clothes on her for the pictures. Ever since I bought her, I wanted to cover her with some paper. It really took less time than I had imagined, and I'm relieved it's done. Week 22: Make Stencils with Silhouette Cameo - My cousin actually finally prompted me to do this when she needed some stencils cut for a party. I made hers on poster board but have since cut some on plastic tabbed dividers for a swap. Continuing to work from my muffin tin, I completed these two pieces. They were both also inspired by the items I discovered in my treasure jar. Week 25's piece is a necklace I made from these bits of rosary-like chain. I think they're actually extenders from necklaces but the necklaces are long gone. It's a simple little thing. Only one card was made this week. Week 24: The background was made with a red marker I was using for something else. There are a few alcohol splatters on it too, but they're hidden behind the heart made of music paper. The paper was painted with acrylic paints and outlined with a basic black pen. The rest of the accents were made with posca paint markers. 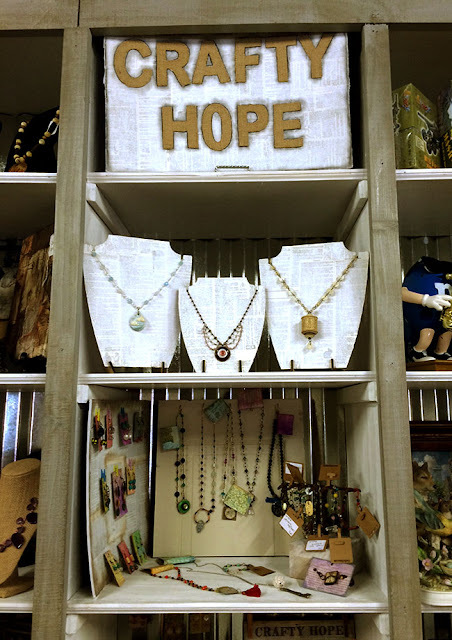 I also shared a peek at the Southern Antiques and Accents CraftyHope booth. I was able to get two pages made this week! Week 23: I started this by placing down all the bits of washi tape stuck to my desk. From there, acrylic paint was smudged and doodled on. The image and words are from a magazine. I doodled on both before splattering the whole this with some white spray ink. Week 24: This page is so very simple, but so glorious! I made some spray alcohol inks using spray alcohol (Dollar Tree) and a variety of markers (also Dollar Tree). 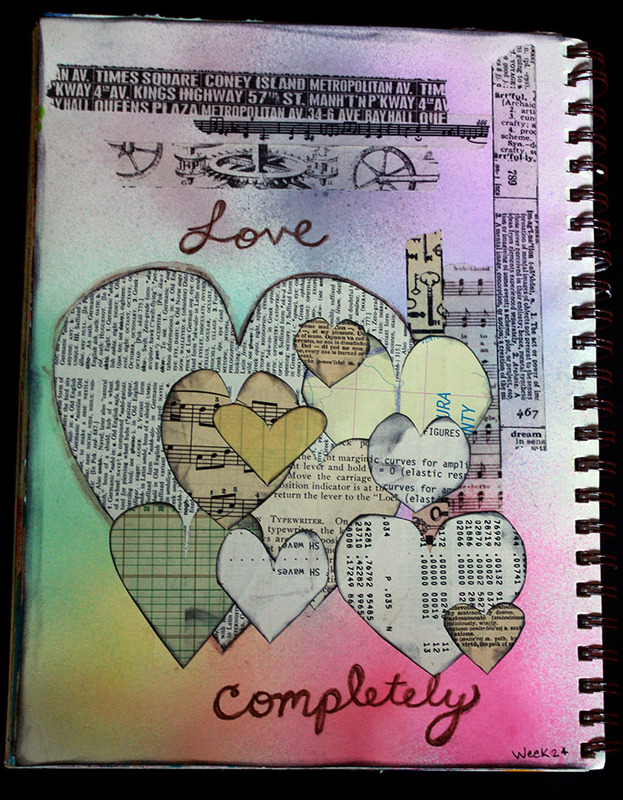 I tested them out on this page and let it dry while I cut out hearts from a variety of papers. The edges of the hearts were inked with black soot distress ink. A few pieces of washi tape were stuck on the before I started gluing down the hearts. "Love completely" was written with a brown stabilo all pencil and traced with a water brush. 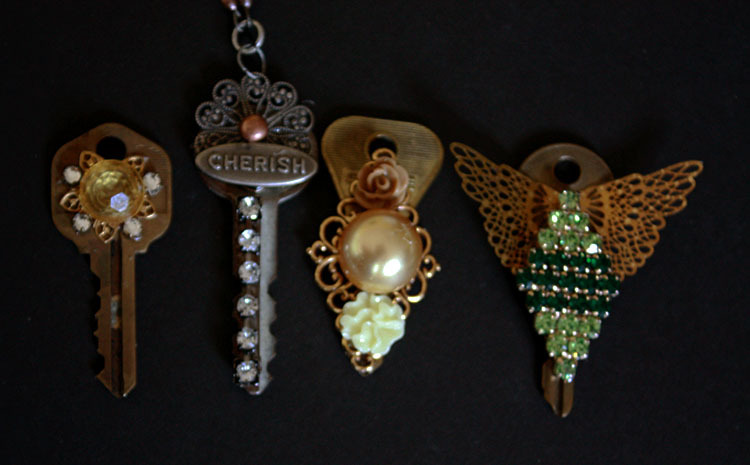 My goal for this week was to make some kind of assemblage piece(s) on a key or other surface. I discovered Teresa Stanton's image of assemblage keys on Pinterest and was inspired to make something similar in my own style. Since I have a hoard of keys and broken jewelry, those are the materials I turned to. These four pieces emerged. I really enjoyed the process and am looking forward to making more. I also completed a few of my backlogged goals. 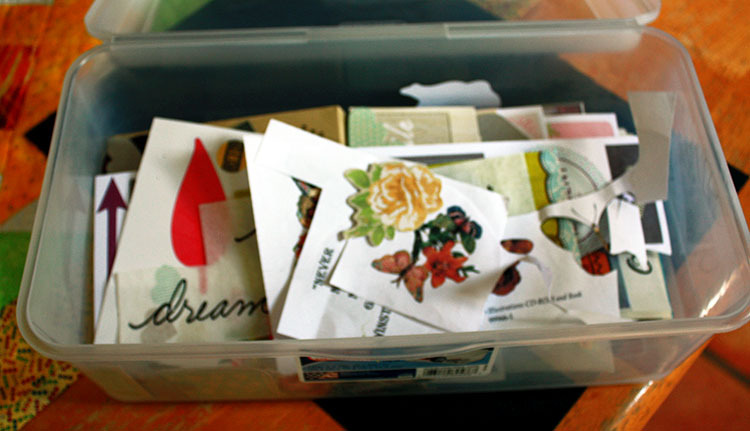 Week 23: Make a file of focal images - It took me a little time to sit down and sort through my stash, but using a shoebox-sized plastic storage container, I created a container full of stickers, chipboard pieces, stamped images, and whatnot that can serve as focals in some of my art journal and altered card projects. 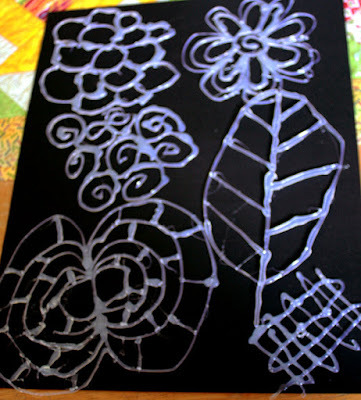 Week 28: Make Glue Gun Stencils - I watched Tiffany's video on making hot glue stencils ages ago. She made it look so easy! Mine turned out wonky and weird. It's likely I won't be making them again. But, I'm glad I tried. Two pieces were made this week. I'm still working on catching up. Week 26: This was another piece from the treasure jar. I removed the broken pin back from the brooch and filed it down. Glass pearls seemed like an obvious choice for the chain of the necklace. Matching up the shade of blue for the dangles was a little tough, but worked out well in the end. Week 27: While searching for blue beads to match the brooch, I discovered some amazonite brolettes in my bead stash. Moonstone-colored Chinese crystals top them off for a sweet pair of earrings. Week 25: I worked on creating this one while playing in my journal. The background's just some acrylic paint brayered on and a teardrop stencil of weathered wood distress ink. The paisley is a stamp I colored in and cut out. "Be Bold" was written with a black pen and there are also some doodles made with a pencil. Week 26: I picked up some Derwent Inktense pencils (permanent watercolor pencils) at long last and used them to create this flower. That was is. Play. Week 27: While I played in my art journal and used prompts, I also worked on this card on the side. For the life of me I don't remember what I used to make the drips, but I know it was with a paintbrush pressed against the tops of the card. I doodled with acrylic paint and a pen, made lines with the side of a gift card, and dotted it with liquid paper. The words are stamped onto deli paper and glued on with liquid matte medium. Dots around it were made with a posca pen. You were treated with glimpses of my Staycation. 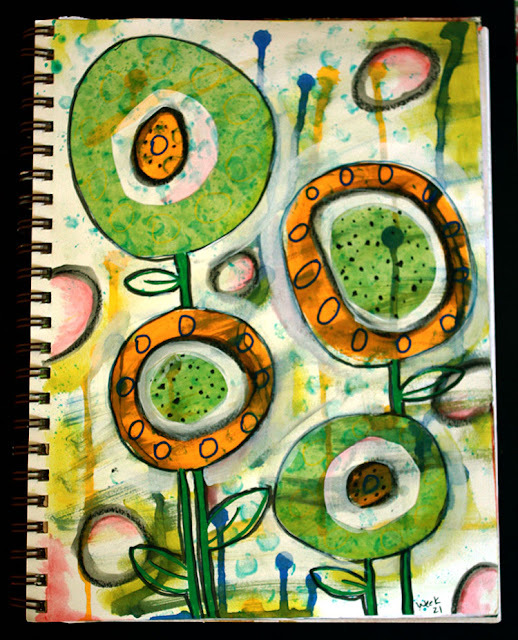 Finally, a few more pages in my art journal. Week 25: This was quick work of some collage papers, acrylic paint brayered on, weathered wood distress ink through a stencil, and the image circled with a black stabilo all pencil. The words were written with a water-based sharpie poster pen and edged with a white stabilo all pencil, I love that I was able to keep some white space on the page. I do struggle with that so. Week 26: Just a silly page created with some of my homemade spray alcohol inks to start. From there, I used prompts to create the page that included collage, doodling, water coloring, acrylic paints, and line-making. The image is from an old yearbook and the words were written on with a posca pen. So, that was my month for the most part. Catching up is hard, but it really feels like I'm getting there a little at a time. Thanks for bearing with this post. 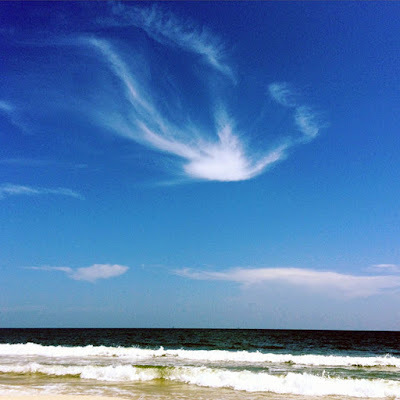 I hope you found some enjoyment and/or inspiration in it. The key assemblages came out GREAT! I saw the pic you pinned on Pinterest and I was immediately drawn to it as well. I also love what you did with the mannequin. Such a great idea! 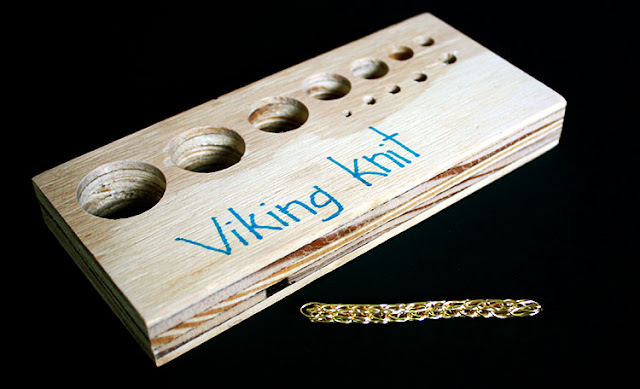 I bought a Viking knot device and have yet to try it. Good for you! I love your assemblage pieces! Oh, and thanks for your sweet compliments on the assemblages. 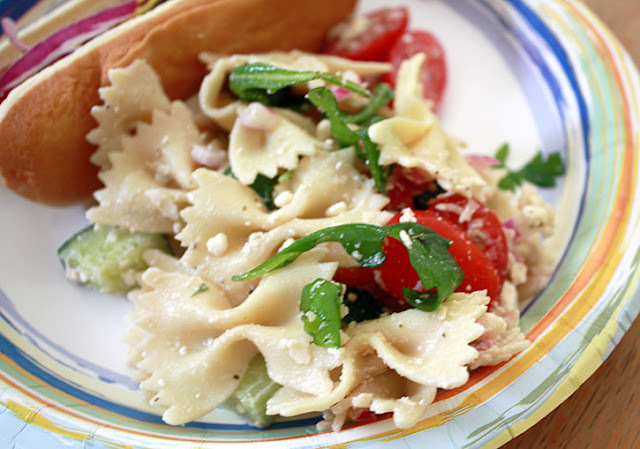 I hate that the picture turned out so crummy, but I'm hoping there will be more to come soon.